GUELPH, ON, February 8, 2019 – OCAS, a non-profit organization with 84 employees, has been recognized as an Employee Recommended Workplace for 2019. 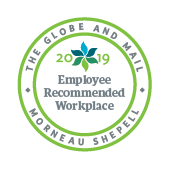 Presented by The Globe and Mail and Morneau Shepell, this award recognizes organizations nationwide that have successfully achieved a healthy, engaged, productive workforce. The Employee Recommended Workplace Award is the only one of its kind that is based entirely on employee feedback. Employees completed a confidential survey evaluating their total health in four key areas – work life, personal life, physical health, and mental health. Organizations that meet the standard of 69% or higher for overall total health score are recognized as Employee Recommended Workplaces, and with a score of 74%, OCAS is honoured to have achieved that designation.